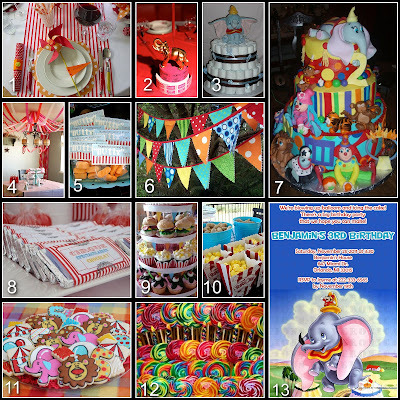 Circus themed baby showers are popular, but add in the timeless Disney classic Dumbo, and you've got a real party on your hands. This would be a fun shower for a baby-boy-to-be or for those brave expectant parents that don't want to know what they're having. The color scheme would need to have the main focus on red and white stripes; you could also add in some blue, green, and orange accents. If having an indoor affair, make a "big top ceiling" with streamers as show in our party board. You can have fun with your menu; it's perfect for an expecting mother. Enjoy all of your favorite carnival foods - popcorn, cotton candy, peanuts, icees, lollipops, pickles, and even grill out burgers if you feel the need. We found these super cute cupcakes shaped like hamburgers, popcorn, and ice cream sundaes. Party favors can include candy bars covered in customized circus wrappers. We also saw this cute marshmallow peanuts that you could match with the wrappers. A great present for every mommy-to-be is a diaper cake. You can add as much or as little as you fair. Lets face it, every parent knows how important diapers are; gifts that you actually use are favorites! Hope you all enjoyed the Dumbo Baby Shower this week. We will be back with another great Disney Party Board next Tuesday. 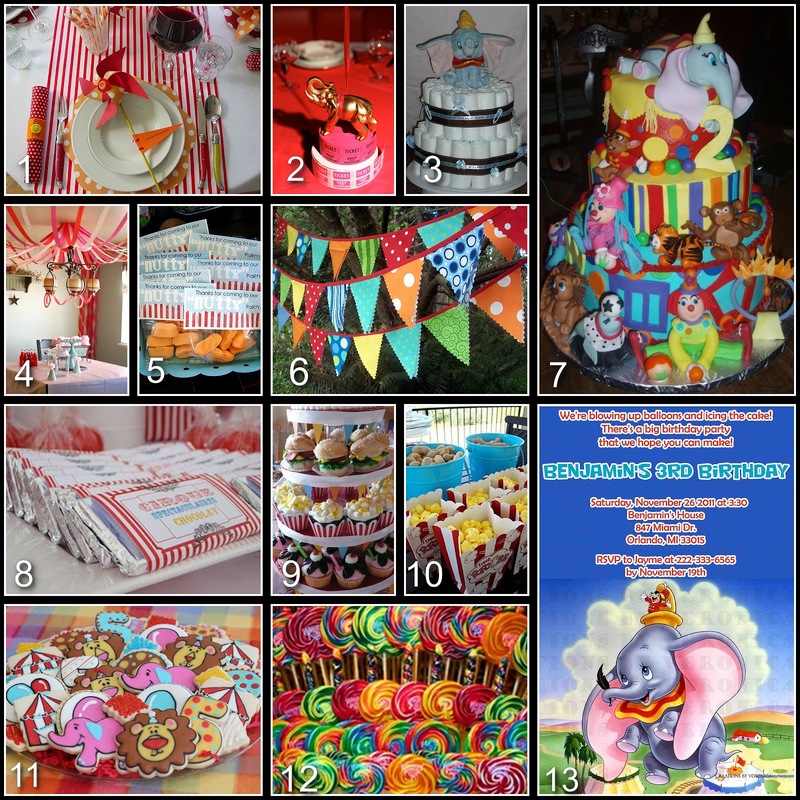 Remember, if you have a Disney party you would like to see a party board for just let us know. If you use any of our party board ideas we would love to see pictures too, you can email them to disneydonnakay@yahoo.com and we will share them with all the Disney Donna Kay readers. Great inspiration! Before I knew I was having a girl, I wanted a Dumbo theme if it was a boy. Once I learned she was a girl, I opted for a Bambi theme. Thanks for stopping by P.T. I am sure the Bambi theme was beautiful. Beth this one was really early on - I probably need to update it with some new ideas and add descriptions to it. I forget how long I have been doing Party Boards. Thanks for stopping by! !